The race in the East is tighter than leather pants. To kick off the day, the Liberty ended a six-game losing streak to rout the Stars, 84-68. For a shining moment, they were first in the Eastern Conference. Then the Sky throttled the Mystics, 85-57, to take first place back. Then the Fever edged the Shock, 83-80, for their fifth straight win. Whoosa! We have a race. Meanwhile, in the Western Conference’s sole game, the Storm downed the Sparks, 68-61. Seattle ended a five-game losing streak, and Los Angeles remains without a win on the road. 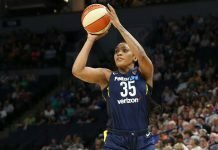 Tamika Catchings moved up to third on the WNBA all-time rebounding list. Glory Johnson has pleaded not guilty in the domestic violence incident involving her and former spouse Brittney Griner. Lauren Hill was posthumously given the “best moment” award. Many feel the Arthur Ashe Courage Award should have been given to Hill. Former Notre Dame guard Danielle Green was honored with the Pat Tillman Award for Service. The NJCAA has levied against the Hutchinson Community College women’s basketball program for eligibility violations. Former San Diego State guard Chloe Johnson has transferred to Davidson. Former Middle Tennessee guard China Dow has transferred to Florida Gulf Coast.